To read more about how to make a strop on our Common Woodworking site, click here. Trouble finding good buffing compound? We use chromium oxide for buffing out our steel cutting edges and removing the scratches from the bevels and flat faces of tools. It’s not rocket science. Chromium oxide abrasives suspended in a suitable compound are readily applied to leather strops for polishing the bevels of chisels and plane irons alike. My five year stick ran down to a 1/2″ nub and I ordered some online that is great and unlike other compounds that are too powdery to apply to strops for hand stropping, this one works perfectly because it is the waxy type and applies exceptionally well to the types of leather strops we woodworkers use. It also applies well to buffing mops for mechanical application if prefer. I use this type on wood for polishing out flat faces too. The bars are really monster bars and one bar should last me twenty years so i might last you nearer 80 if you don’t run a woodworking school as I do. The producer/distributor for the UK is Silverline and the best place to buy is of course eBay. Shop around a little. I got mine for £5.25 including free shipping and delivery was next day for me. I recently got my first buffing compound (from Lee Valley), can I use it for the bevel and back of my blades on wood/mdf/glass-with-painters tape as a base instead of a leather strop? I just got what looks like the same sized block from Amazon in the US, sold by Woodstock. Roughly the same price. Worked well for me. I also tried the Lee Valley green compound, but I’ve found it not very good because it leaves evident scratches. I’m the only one who noticed this problem? I have been using the compound from Lee Valley for a couple of months and not noticed any scratching. Seems to work just fine. If you are seeing scratches it is most likely due to agglomerates of the chromium oxide particles as a result of sloppy manufacturing. I suspect these products are made by melting wax then adding chromium oxide green followed by heated 3 roll milling on what is commonly referred to as a paint or ink mill. Picture 3 rolling pins laid side by side. The rolls on the machines are brought to bear on one another and the product being milled is actually providing the lubrication. The rolls themselves are very slightly crowned, ie they are tapered so that the middles are a larger diameter than the ends by a few thousandths or less. Material coming off of the ends of the rolls will have a larger particle size than material from the center. This outside material is supposed to be collected and fed back through the mill. If this isn’t done you could be seeing a particle size of 100 mesh or larger. You might try melting some of the compound on a putty knife and spreading on a piece of glass or something flat so it goes from thick at one end to zero thick at the other. (I don’t know if it will melt having never tried it). Large particles would show up as streaks. If that is the case, there is no way to fix it other than finding a more conscientious supplier. Thank You for the information I have been using a yellow compound and it doesn’t work very well . The reason I posted a UK supply source is because people seem to experience difficulty finding it here. I’ve been making do with Farecla polishing compound up ’till now (a more expensive version of T-Cut). It’s worked pretty well all things considered (you have to apply a puff of water from a sprayer for best results). I’ve just ordered a block of this stuff though. It will be interesting to see how much of a difference it makes. I have used the Porter Cable light polishing compound that is available at Lowes and it works fine for me. 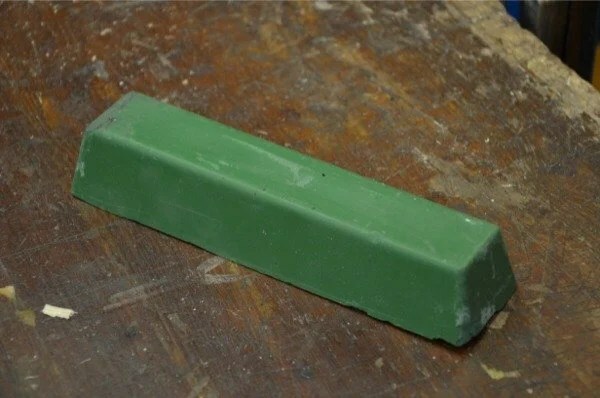 It is the green chromium oxide suspended in a wax. Harbor Freight has a green stick for honing, but it was a bit chalky. It did work, however. Surprisingly to me, after I had spent time looking all round for a chromium oxide stick that I could buy in a store, I found one the size of a loaf of bread at a truck stop. It seems truckers like their shiny chrome. So, next time you’re hauling material across I-80, stop in for a look at the trucker’s supplies. I have had the same bar for at least 4 years and have plenty left. Just a question if I may. I have also used “polishing compound” the type used on cars. It is white and soft and spreads nicely on a piece of hard maple. When it becomes dry I just sprits it with a little water. Seems to work. Any opinions on using this type of product, good, bad , indifferent? I have used McGuires car polishes in times past when I forgot my buffing compound somewhere and it worked fine. Turtlewax!!?? Fine finishing compounds, usually designed for the auto industry, are always dry and powdery as they don’t want to finish and leave a greasy layer. Using a grease bar enables you to strop with the best compounds. Admittedly I use them mainly for carving tools, but it’s just as applicable for plane irons and chisels. Thanks for running this site Paul. It’s one of my favourites. Here where i live, stropping compound is not that popular. The closest thing i can find to one is a product by the brand Langsol. Applying it however is a bit tricky as it tends to crumble. It resembles the feel of a soap bar and getting some to stick to leather is quite difficult. Seems i lost more crumbling off the strop in the process. It polishes quite well though, and i can feel i can get nice edge easy. Now as this bar of Langsol i purchased is like 500gr or so, i really want to make it work. Anyone can share a tip on how to apply it to leather? See above! Grease bars are available wherever you can get Menzerna compounds. Try a light misting on the strop with water to see of this helps the compound to adhere a little more readily and for longer. If the pictures are not clear enough, write him an eMail. He will help you, I am sure. Not sure what “leatheroil” is but the traditional oil used on leather is neatsfoot oil. Neatsfoot oil from cattle feet & smells of beef dripping (there is a Scottish leathercraftsman on youtube who uses beef tallow and carborundum powder on one side of his strop – the coarse side). Neatsfoot oil would likely help preserve a leather strop but use very sparingly as it also softens leather, I use it mainly as a leather softener. I believe cod liver oil (or was it castor oil?) was traditionally sometimes used in the tanning process. thanks for the feedback. misting the leather does make the compound stick easier. its not as slick as i imagine wax based would, but its better. interesting points re: the grease bars and leather oil. shipping cost to this part of this world is rather expensive and i have long vowed not to make a purchase if the shipping equals the actual price (wife made me after my ebay planes spree). ill look for a locally available alternatives. I’ve not used this for sharpening but you can get excellent results for polishing metal using standard toothpaste. I rub it in using the fabric from an old cotton T-shirt and then buff it up with a standard yellow duster. The results are pretty impressive considering the outlay. It tends to work best if you give the area to be worked a spray of water so you can work the toothpaste into a slurry. I’m not sure if people would like “minty fresh” tools but if you don’t have any money to spare on polishing compound it’s worth to effort of a bit of experimentation. As I say, I’ve only used this to polish metal rather than give a cutting edge that extra bit of sharpness but I’ve had to work on a shoestring budget in the past so I thought I’d share this info. Try the white and see what you get. It will most likely work just fine. Green is the one we generally use and It can be somewhere between 10,000 and 13,000 grit. Bought mine from a traction engine rally seller. I asked about the colour, was told the lighter the finer it is. Bought light and dark green. Thank you, Paul, I was wondering about the appropriateness of exactly this silverline block that I found on amazon. So Silverline is a decent brand for polishing/buffing compounds? The blog mentions chromium oxide compounds though the Silverline Tools website lists their polishing compounds material as aluminium oxide. Hello, Does anybody knows if Brasso is any good for this? Sadly is the only thing I can find in my town in Mexico. Ordering from the internet is a little expensive for me. Thanks. It’s not aggressive enough. You can use car polish though. Some of the cheaper toothpastes work OK as a buffing compound for fibreglass work. It might be worth giving it a go for sharpening. I will try that, thanks a lot sir. Hi Paul, Can you please tell me the make of diamond sharpening blocks that you use and where is the best place in the U.K. to buy them from, many thanks, Graham. Go to eBay. EZE-Lap are the makes.